The new BMW X2 Hatchback is yet another bulky family car from the premium German brand. It’s an interesting proposition with its unusual Coupe looks and low seating position, but it’s very much a niche choice. Sitting so low means that it’s up against much taller riding competitors. The idea behind this is that a low set driving position will enhance the way it drives. That it does, but has the X2 got everything else you need? BMW started out making aircraft engines during the First World War. Find out how they went from the air to the road and became one of the most popular cars in the UK in our brief history of BMW. OSV takes a closer look at what it’s all about with our 2018 BMW X2 Hatchback review. The X2 is based on the X1, and we’re led to believe that BMW have spent an extensive amount of time tweaking this car’s architecture so that it’s as good to drive as a car this big can be. We certainly have no complaints with the steering – it’s sharp, direct, and feels well-weighted. It does feel heavy when you put your foot down, but it’s agile enough on twisting roads. Buyers can choose between front and four-wheel-drive models, with the former more nimble and sure-footed. Both variants are comfortable, and the X2 is at home in urban settings just as much as it is out on the motorway. Ride quality is good too, especially at speed. That said, you might notice lumps and bumps a bit more at lower speeds. Electronic Damper Control is available as an optional extra, but Sport models come with larger 19” alloys that find it harder to cope with rougher surfaces. In terms of its engines, there’s not a lot to choose from if you’re a petrol fan. In fact, there’s just one and it isn’t yet available here in Britain. This is a 189bhp unit that powers the sDrive20i model. It’s front wheel drive only, which means that if you want a four-wheel drive engine you’ll need to go for one of the diesels. 0-62 is dispensed within 7.7 seconds and max speed is 114mph. If you can’t wait for the petrol engine to be launched, there are a couple of diesels to choose from. The 20d is available in two separate guises, with the more powerful 187bhp able to match the petrol engine’s 0-62 time. A smaller 148bhp variant, meanwhile, can get you from rest to 62mph in 9.3 seconds. Both diesels can be chosen with either front or four-wheel-drive. The X2 is aimed at a younger section of the market, and this is clear when you take a look at its cabin. It’s a pretty straightforward affair that’s almost near-identical to the X1. Its layout is neat and tidy, the materials used are of a high quality, and the instrument panel is entirely digital. The lower spec models come with a 6.5” infotainment system as standard, while higher-spec models get a bigger and crisper 8.8” touchscreen. All models, meanwhile, come with the brand’s excellent iDrive system. The interfaces are easy to operate, the system is fast to respond, but curiously the car doesn’t cater for Android Auto. Is the BMW X2 Hatchback practical? A low driving position won’t please all buyers sniffing around this sector of the market, and the X2 indeed lacks a commanding view of the road ahead. The rear window is also a tad on the small side, which further restricts your visibility. Other than that, the car’s proportions are similar to the X1, which means leg and headroom is reasonable for all. The boot, meanwhile, measures 470-litres – average for this class but much smaller than the X1. Are BMWs reliable? Read about their reliability in our honest assessment of the brand. Standard kit across the range is very good. 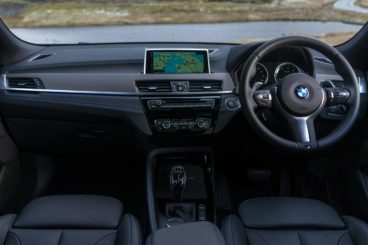 The entry-level model gets a useful 6.5” infotainment system, dual-zone climate control, alloys, a digital radio, cruise control, rear parking sensors and sat-nav. The Sport model is next up and it adds LED fog lamps and headlamps, LED interior ambient lighting, 18” alloys and sports front seats. 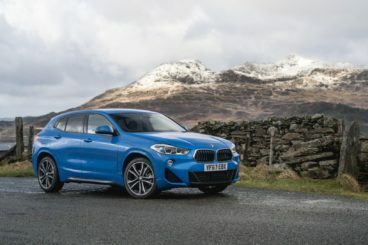 Meanwhile, the M Sport model gets 19” alloys, sports suspension, unique upholstery and heated front seats, while the M Sport X model tops the range with aluminium trim for the exterior, a muscular body kit and leather upholstery. In terms of how safe the car is, the X2 shares its safety rating with the X1, which scored all five stars when it was crash tested by Euro NCAP. Standard safety kit for the X2 is a bit sparse if you stick to the basic model. If you want the likes of speed limit warning, autonomous emergency braking, auto dipping headlights and lane departure warning, you’ll either need to pay extra or upgrade to a higher spec model. Prices for the new car start at £29,995 and rise to £38,335. For more information on our leasing deals, you can check out our page here. In terms of its running costs, the sole petrol engine that’s anticipated to arrive later this year is expected to return 48mpg on a good day in the M Sport trim. This means that you can expect to average over 50mpg economy in standard guise. Meanwhile, it will emit 134g/km of CO2, which gives it a very respectable BiK rating of 25%. Insurance-wise, the X2 does okay. The SE trim sits in group 29 for the petrol model and group 32 for the M Sport. BMW don’t do ugly, awkward cars, but there’s always a degree of apprehension whenever a premium automaker produces a heavyset car like this one. Again, you expect size to count against a car in so many ways – not so here, and the X2 is one of the finest handlers in this class. Expect to return over 50mpg from the petrol engine on a daily basis. The Audi A3 is far cheaper to buy. Ride quality isn’t the car’s strong point, and it’s far from supple. Let’s see how the car fares against its rivals in the comparison section of our 2018 BMW X2 Hatchback review. The new Audi A3 is great to look at, both outside and in. On the road, the A3 can’t match the BMW for driver engagement, but it’s still a very good – and very easy – car to drive. Its predictable handling will suit families who want to feel safe, while its ride is quiet and comfortable. The engines – of which there are many – are smooth, performative and affordable to run. Where the petrols are concerned, the entry-level 1.0-litre TFSI unit kicks things off. It develops a healthy 113bhp and has a 0-62 time of less than 10.0 seconds. It’s a refined, quiet engine that’s light enough to feel fairly lively. A bigger 1.5-litre TFSI petrol engine is a better all-rounder. It develops 148bhp, feels nice and crisp, and covers the 0-62 dash in 8.2 seconds. Rounding off the petrol range is a 2.0-litre TFSI engine that covers the 0-62 sprint in 6.9 seconds. Running costs? The 2.0-litre engine is naturally the most expensive to run, but it still returns a very respectable 50.4mpg economy. However, the 1.0-litre engine is the real star of the show here, with its remarkable returns of over 70mpg on a good day. It also has a BiK rating of just 19%. Inside, Audi has developed a reputation for crafting some of the best cabins around, and they’ve delivered the goods once again. This is a premium interior that boasts top-notch materials and a minimal design that’s easy on the eye. Audi’s excellent Virtual Cockpit system is optional on some models and well worth adding, and it comes with a high-res 12.3” TFT screen that’s fixed to your dashboard. The dashboard itself is neat and tidy, and super stylish. What the A3 isn’t, however, is radical in its design. 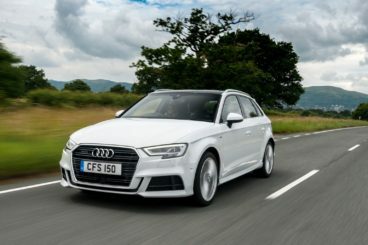 Is the Audi A3 Hatchback practical? It’s longer than last time and can claim to be one of the most spacious cars in this market. It’s durable too, full of storage solutions and clearly designed with families in mind. That said, two adults will be far more comfortable in the rear than three, while the middle rear seat misses out on ISOFIX child seat mounts. The boot, meanwhile, measures 380-litres, which is a noticeable improvement on its predecessor. Fold the rear seats and you can extend it to 1,220-litres. The new Mercedes A-Class is superbly put together and boasts the best cabin in this class. It’s into its third generation and has evolved brilliantly, with its driving experience one of the most mature in this – or any – sector. Indeed, Mercedes have put fun on the back seat, and the A-Class instead focuses on comfort and refinement. That’s not a bad thing, of course, but the precise steering can be a tad slow to respond. There’s plenty of grip on offer, though, and overall this is an easy car to drive. In terms of its engines, a 1.4-litre opens the petrol range. It’s small but comes with turbochargers for a bit of oomph, and covers the 0-62 dash in 8.0 seconds. That looks good on paper, but be warned – this isn’t an engine aimed at enthusiasts, and it does moan and groan when you accelerate hard. A 2.0-litre petrol engine that powers the A250 model is a better bet. It develops 221bhp and can get you from rest to 62mph in 6.2 seconds. It’s not as punchy as anything offered by the BMW, but it’s capable and covers the miles with no hassle. It’s also really comfortable. Running costs? The smaller petrol engine can return 53.3mpg on a good day while emitting 123g/km of CO2. The bigger engine, on the other hand, manages just 45.6mpg economy at best, emits 141g/km of CO2 and has a BiK rating of 29%. Inside, there are few words that do justice to this 5/5, high-quality cabin from Mercedes. It’s the best in this review and the best in this whole market. The design manages to be both understated yet very contemporary, the comfort levels are beyond luxury, and the dashboard comes with two 7” infotainment screens. If you want, you can upgrade both of them to 10.25” so that they include 3D mapping. 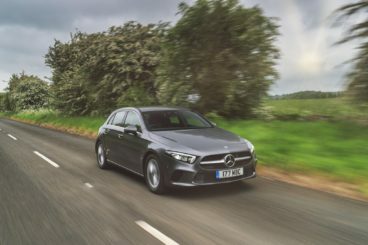 Is the Mercedes A-Class practical? It’s bigger than last time, but if there’s one area where this car is found lacking, it’s here. Those up front will be perfectly fine, but anyone sat in the rear will feel a bit cramped – and this especially goes for six-footers. Headroom is the biggest issue, closely followed by a lack of knee room. The boot, meanwhile, is bigger than last time but still comes in at 370-litres, which is some 100-litres smaller than the BMW. With its stylish looks and its neat handling, the X2 is a born winner in a sector of the market that’s filled with notoriously picky buyers. That said, it’s only a born winner in certain departments. As ever for a BMW, it drives superbly and it’s a beautifully crafted product. But a low ride height, a firm ride and a high price all count against it. Put simply, you’ve got a big decision to make regarding the new BMW X2 Hatchback.